Before either team steps on the field, Tampa Bay will have a three-point lead. The Buccaneers should beat the 49ers on Sunday. It has nothing to do with Jameis Winston or Ryan Fitzpatrick. It has nothing to do with Dirk Koetter or Todd Monken. It has nothing to do with the defense or the kicker. It has nothing to do with giveaways or takeaways. In fact, it has nothing to do with football at all. The reason why the Bucs should win? No, not the game clock. The body clock. Circadian rhythms. You know, science. Evolutionary biologists believe that, like the Earth, our bodies run on a 24-hour cycle. This cycle tells us when to wake up, when to eat, when to watch football and when to sleep. For the Bucs, Sunday’s game is business as usual — a little Fortnite on Saturday, rest and then kickoff. For the 49ers, though, it’s a disruption, a deviation from the norm. They’re used to playing games at 4 or 4:30 p.m. EST. Big deal, right? Aren’t these professionals? It’s the same game on the same field, isn’t it? All that’s different is that one team is playing three hours earlier than it usually does. That might seem like a negligible difference, but in a league where talent is relatively evenly distributed across 32 teams, it’s huge. In this game, little advantages become big advantages. Granted, it’s not like the 49ers will be sleepwalking. They’ll be awake, probably. But their bodies will think it’s the morning. Body temperatures tend to be lowest in the morning and highest in the late afternoon. The lower the body temperature, the slower the reaction time. This isn’t supermoons-drive-humans-mad stuff. We don’t need a laboratory to conduct an experiment to prove that circadian rhythms are a thing. The NFL already has done the work for us. Since 2002 — when the league last realigned — there have been more than 200 games in which a team from the AFC West or NFC West played an early-afternoon game on the East Coast. The results of those games show that the away team is at a significant competitive disadvantage, so much so that you wonder why the NFL ever schedules such games. The away teams tend to be sloppier than usual, committing 1.71 turnovers per early-afternoon game. In general, away teams average 1.65 turnovers per game, regardless of the start time. The away teams also tend to score fewer points and allow more points in early-afternoon games on the East Coast. The point differential in such games increases from the usual 2.5 points to 5.8 points. By scheduling these games, the NFL essentially is giving the home team three points before the players even take the field. Three points! As a result, home teams win nearly 70 percent of the time. In general, home teams win 57 percent of the time. What about the Bucs? Well, as you probably could guess, they haven’t seized this advantage as much as other East Coast teams. Every East Coast team has won at least half of its home 1 p.m. EST games against teams from the AFC West or NFC West. Eleven of the 12 have won more than half. The Dolphins, one of the NFL’s worst teams over the past two decades, suddenly become the Patriots in these games. One has won exactly half: the Bucs. They’ve lost four straight, last in 2016, a 30-24 loss in overtime to the Raiders in which they allowed Derek Carr to throw 513 yards and four touchdowns. So while the Bucs should win, they are the Bucs. As its league-leading 29 turnovers suggest, no team beats itself as often as Tampa Bay. The Raiders-Ravens game is another West vs. East early-afternoon special, making Baltimore one of the safest bets of the weekend. There’s a good chance the Giants lose, too. Teams who have beaten the Bucs this season are 1-5 in their next game. Bucs receiver DeSean Jackson: No target is more boom-or-bust for Bucs quarterbacks, no matter who is throwing the ball. When targeting Jackson, Winston and Fitzpatrick have combined to throw seven interceptions, three of which they threw in last week’s loss to the Giants. By passer rating, they’ve had the most success throwing to Chris Godwin (116.3) and the least throwing to Jackson (86.9). Jackson, though, is averaging about 20 yards per catch, by far the most on the team. 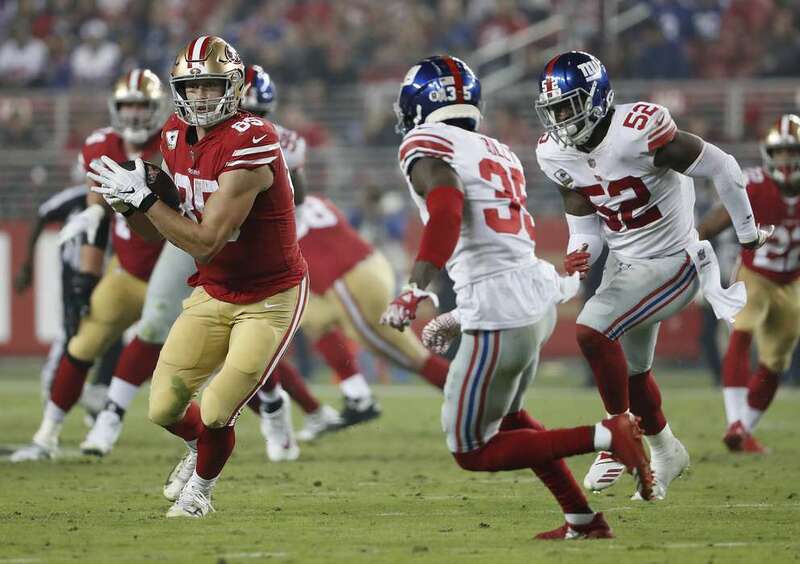 49ers tight end George Kittle: Kittle is San Francisco’s leader in targets (71), catches (50) and receiving yards (775). He is not only one of NFL’s most productive tight ends but also one of the most efficient. He is averaging 15.5 yards per catch, and seven out of every 10 of his catches have resulted in a first down. More than 500 of his receiving yards have come after the catch, largely because he consistently gains several yards of separation. His 3.6 yards of separation per target ranks third among tight ends and is a half yard more than Chiefs speedster Tyreek Hill, according to the NFL’s Next Gen Stats. At 6-foot-4, 250 pounds, he is a matchup nightmare for a Bucs defense that’s starting practice-squad linebackers. 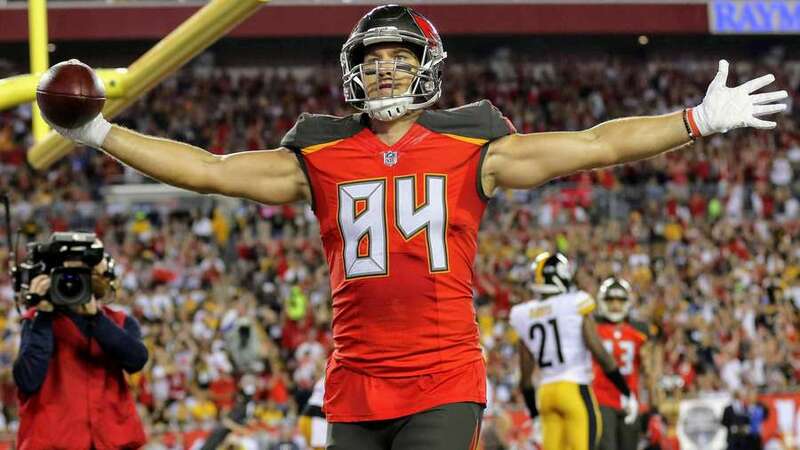 Opposing receivers — tight ends especially — have ransacked Tampa Bay’s pass defense. They’ve scored five touchdowns and are averaging about 80 receiving yards per game. 49ers receiver Marquise Goodwin: After San Francisco hired Kyle Shanahan in 2017, one of the first moves the new coach made was to sign Goodwin. In four seasons with the Bills, Goodwin looked more like a track star than a receiver, which made sense given that he was a two-time NCAA champion in the long jump and a four-time All-American. In his first season with the 49ers, however, he excelled and became one of quarterback Jimmy Garoppolo’s go-to options. He saw 105 targets, a team high, and gained 962 receiving yards, also a team high. Goodwin is to the 49ers what Taylor Gabriel was to the Falcons when Shanahan was the offensive coordinator in Atlanta in 2016. Averaging a DeSean Jackson-like 16.5 yards per catch, Gabriel emerged as one of the league’s top deep threats that season. In the Falcons’ Week 9 win over the Bucs, he caught five passes for 52 yards and scored a 9-yard rushing touchdown. In case you wiped it from your memory, Gabriel, now with the Bears, burned the Bucs earlier this season as well, catching seven passes for 104 yards and two touchdowns. Goodwin has had a quiet few weeks, but there’s a good chance he’ll make some noise against this Bucs defense, which is allowing four 20-yard pass plays per game. Only the Chiefs and Rams have allowed more explosive pass plays. 49ers running back Matt Breida: Before the 2017 draft, Tampa Bay showed interest in Breida, a graduate of Nature Coast Tech in Brooksville. 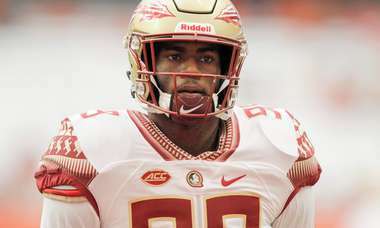 The Bucs ultimately selected Jeremy McNichols in the fifth round; Breida signed with the 49ers as an undrafted free agent. Breida has gained 756 yards from scrimmage this season; McNichols has gained 4. That Breida, who played high school football about 40 miles away from Raymond James Stadium, got away must hurt. And when you consider his ties to members of the Bucs staff, it must sting even more. Jeff Monken, cousin of offensive coordinator Todd, recruited Breida to Georgia Southern in 2013. Plus, Koetter actually attended one of Breida’s games after he heard about him from the school’s athletic director, friend Todd Kleinlein. Koetter told San Francisco reporters this week that he came away impressed. The Bucs have a prime opportunity to make a move up the 2019 draft board. What’s best for the organization, though, isn’t necessarily what’s best for its current players and coaches. Winston has the most at stake. Since 2015, he has had 16 multi-interception games, more than anyone else. Will Sunday against the 49ers be No. 17? It shouldn’t be. San Francisco has intercepted only two passes all season. The pick: Bucs 23, 49ers 14.